Quick Potato Rolls - ready in 15 minutes!! No rising! Mix, press, cut and bake. Perfect for breakfast, lunch or dinner!! Instant mashed potato flakes, sugar, butter, water and Bisquick. 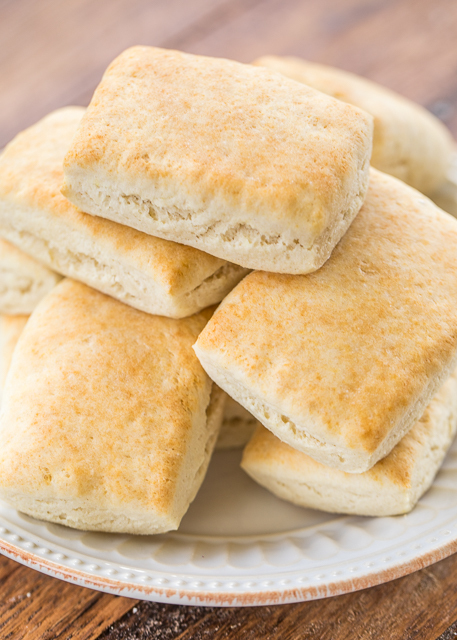 Serve the biscuits with butter, honey, syrup or jam! These rolls fly off the plate!! Everyone LOVES this easy bread recipe! These Quick Potato Rolls are a weeknight favorite. They only take a couple of minutes to make and are on the table in 15 minutes! No rising. Just mix the dough, press into a rectangle, cut and bake. They are great for dinner or even breakfast! 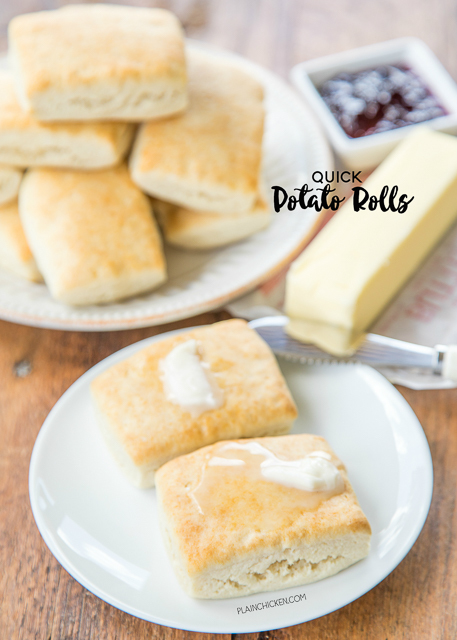 The secret to these quick and delicious rolls is Bisquick and instant mashed potato flakes. I always have both in the pantry. They make the rolls so light and fluffy! We love to eat them right out of the oven with a big dollop of butter. We also have been known to eat the rolls with some honey, syrup and jam. I just love how quick and easy these rolls are to make. I make them at least once a week. I definitely prefer fresh homemade bread over any other type of bread. 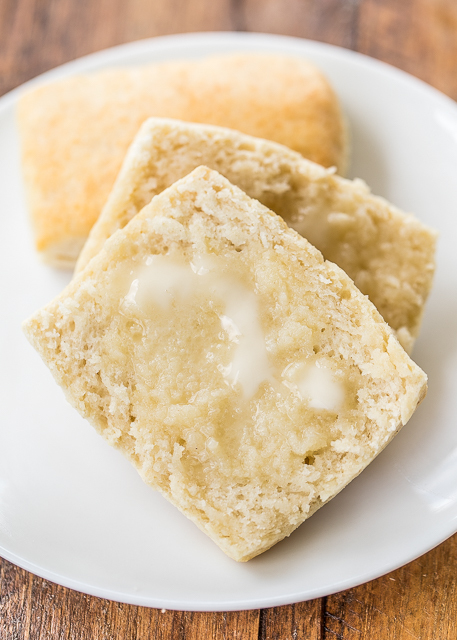 Give these a try when you want some homemade bread but don't have all day! In the bowl of an electric stand mixer, combine all ingredients. Mix on low until a soft dough forms. Mix for 1 minute. Roll dough out into a 10x6-inch rectangle. Cut into 12 squares. Place rolls onto a parchment lined baking sheet. 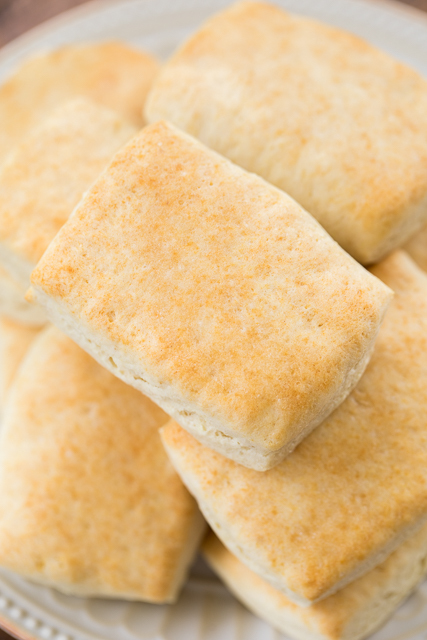 Could these be made ahead and frozen as individual rolls, and baked later? You can definitely bake them, freeze them and reheat the rolls. I haven't frozen the dough and baked later. Let us know how it turns out if you try it.